Outline for Opportunities | Create. Communicate. Connect. Happy New Year, writers! This post comes to you from the snowy grounds of Ragdale, where I have the good fortune to be one of twelve artists-in-residence for the month of January. I had grand plans to write a blog post a week while I was here, but the first two weeks of my stay I was so deep in revisions for my novel that I’ve only just now come up for air. Before I finish revising, I’ve decided to take a pause and do a post I promised someone a few weeks back about non-traditional ways to outline fiction and plays. When I give feedback to writers, I find myself most often talking with them about what I call missed opportunities – the details they’ve smartly layered in to their story but haven’t taken full advantage of yet. If writers find a way to mindfully track these opportunities as they write, they’ll often find they have all they need when they come up against writer’s block or revision time. 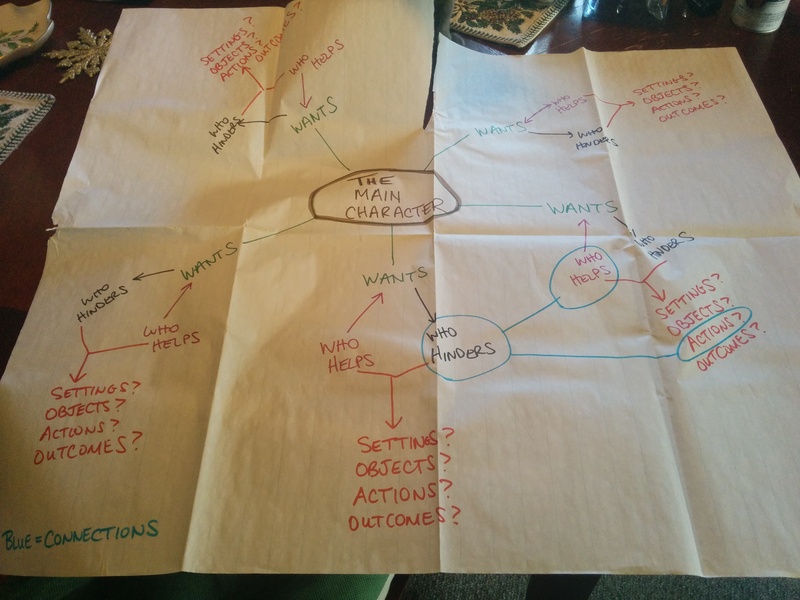 So, I tend to think about outlining as a process that can serve the following goals: plotting and tracking the arc of the story, cataloging connections and opportunities, and supporting the revision process. When selecting a method of outlining, it’s good to not only think about how your brain likes to organize and work with information, but which method is best suited to support the type of story you’re aiming to tell. Without further ado, here are three non-traditional methods of outlining that I highly recommend. Best For: Tracking the arc of the story, cataloging opportunities and cultural/thematic information, heavy use in revision. Recommended When: The writer is a visual/kinesthetic learner, or working with an imagined world, a historical world, or a series. My current Sticky-Note Tracking for my YA novel. As you can see, this is the method of outlining I’m using for The Legend of Blossoming. The great part about sticky notes is that they are flexible, movable, reusable, and easily disposable. For writers who are visual or kinesthetic learners, the fact you can touch and rearrange these notes as you think things through is invaluable. When it comes to creating categories, I recommend that the writer tracks Characters, Locations, Significant Objects, Conflicts, and Unanswered Questions. Within any of these categories a writer will find great resources to return to whether they are writing a first draft or revising. For the Legend of Blossoming, I added Culture and Rituals to my wall so that I always have an easy reference guide for this world I built from scratch. A writer can also track things like key dialogue or repeated phrases, laws or rules, or any other category that she feels is crucial to her story. As you can see in the photograph, I color code my categories. I find this a helpful reference point to take temperature of how many characters, settings, and so on I have at any given time as I write. A writer certainly doesn’t have to color code if she doesn’t want to. A Sticky-Note French scene for Chapter IV. As a cure for writer’s block. 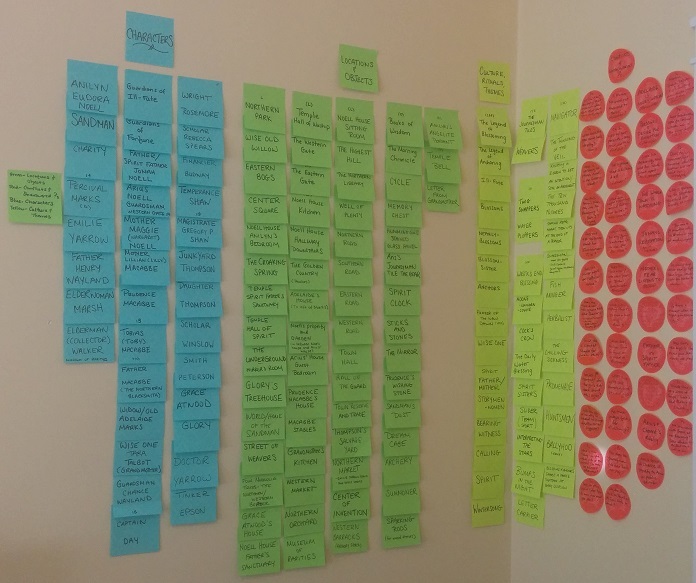 Pull some sticky notes together to make an interesting premise and take a picture. Do this a few times, thinking of it like a puzzle. When you find a few pieces that “fit” together in a way that inspires you, write that scene. Even if you don’t ultimately use it, it can lead to another idea that propels you forward. To brainstorm/track the arc of the story. As you can see in the picture to the right, I snap a photo of each French scene within my chapters. When I print out these photos and line them up, I literally create my story’s arc and access any trouble spots that may need revision. When I revise a chapter, I simply take a new photo to replace the old one in my arc. To brainstorm/track multiple locations, time periods or worlds. For any science fiction, fantasy, or historical writers out there, another way of organizing your wall is by worlds or time periods. Keeping your lists of characters, settings, and so on separate for each world will give you great visual that allows you to draw comparisons that you may not have noticed otherwise. To track unanswered questions and revision goals. As you read through your draft, create columns of questions. If you find the question is answered later in the draft, victoriously throw that sticky in the trash. If it isn’t, keep it up on the wall. After you finish reading, assess the wall of questions and rearrange them into chapters where you think that question could be answered. As you do this, you’ll find that some of the questions are negligible and don’t need answering. If you’re writing a series like I am, you’ll find that some of the unanswered questions will be passed forward to the next book in the series. Best For: Tracking relationships and connections, cataloging opportunities and conflicts, moderate use in revision. 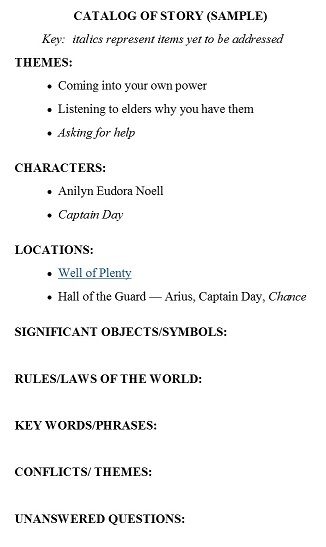 Recommended When: The writer is a visual/kinesthetic learner, working on a world with a few central characters or locations, working on a character/connection driven story, or working on a non-linear story. When it comes to creating categories, the writer should think about who/what are the lynch pins of the story and place those bubbles first. These bubbles can be the major character(s), setting(s), key object(s), or a blend of all these, but the writer should consider the crucial elements only. From there, the writer should determine what other major categories will be the spiders on the map; in the photo, for example, you’ll see that the main character’s “wants” are what spider off and create different areas. Writers can also map by chapters, other characters, other locations, or by key actions or obstacles. Whether a writer chooses to completely color code the map by category or not, I always recommend using another color (blue in the photo) to represent connections. This allows the writer to assess if the web of the story is tangled enough, or if a bit more work needs to be done to tie things together. As a cure for writer’s block. Take a look at the map and make a list of a few things that aren’t connected yet, and then a second list a few things that are. Create a scenario using the material from either of those lists and write that scene. To brainstorm/track relationships, conflicts, and connections. This map can be an ever-evolving record of the pathways in a story, allowing you to see if Harry really has met Sally or if that’s a scene you still need to write. It’s also an excellent way to track how much each major element is involved in the conflict, showing you at a glance where you might go deeper in your first draft. To track unresolved conflicts and revision goals. With this visual map, it’s easy to see if there’s a thread left unresolved. Unlike Sticky-Note Tracking, however, it’s much harder to incorporate notes into the map – it’s best to jot those down elsewhere. Best For: Enhancing a traditional outlining process, projects where writers need to track many categories, connecting information to outside research, keeping track of first draft progress. Recommended When: All projects, but especially when the writer is working with an imagined world, a historical world, or a series. Does anyone else wish they could forget that part of the Iliad that droned on about every blessed person and vessel that sailed to Troy? I sure do. At any rate, once a writer is waist deep into this method it’ll look much like that. I recommend this system to writers who think in lists, who need to track a large bodies of details, and who enjoy thumbing through catalogs to go shopping – in this case, the writer is shopping through her own ideas. As this list isn’t as interactive as the Sticky Note Method or the Spider Mapping, this method isn’t advantageous for revision beyond logging notes and ideas. Unless a traditional outline accompanies this catalog, this is also not an ideal method for a writer to track the arc of the story. A writer can elect to build her catalog in a .doc or a spreadsheet. 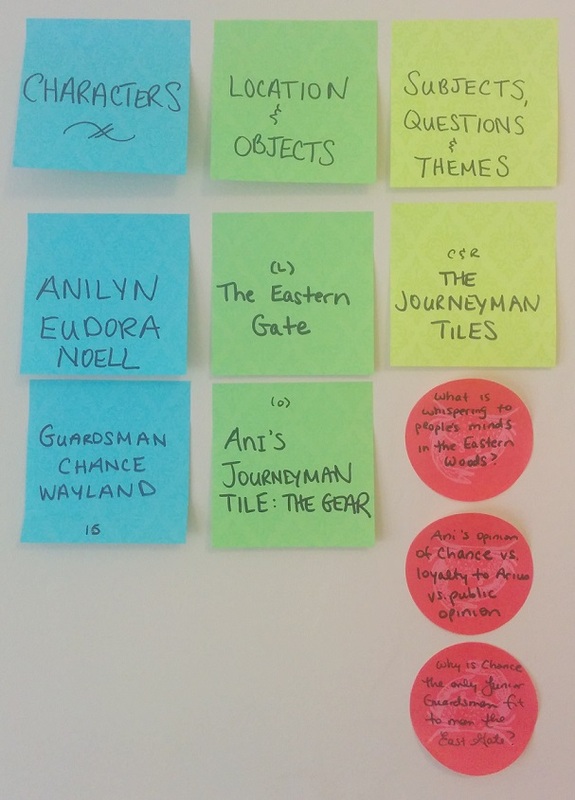 As with Sticky-Note Tracking, I recommend that the writer tracks Characters, Locations, Significant Objects, Conflicts, and Unanswered Questions. In fact, document allows the writer to track an unlimited number of categories. In my own Catalog of Story, I’m tracking Colloquial Phrases, Food, Vocations, and Possible Themes/Ideas in addition to the above. As a cure for writer’s block. Pull one item from 3 – 5 of your categories to make an interesting premise. (If you’re using a spreadsheet to catalog, you can use dice to roll what rows you pick from!) Repeat until you find a combination that sparks an idea, and write that scene. To brainstorm/track details and opportunities. As mentioned above, this is a great way to keep track of any small details you may want to return to in later scenes or chapters. You can keep lists of what characters are already connected to a certain location, for example, and note which characters you still have to connect to that place. Connecting details to outside research. Whether the catalog is a .doc or a spreadsheet, either form allows you to integrate links to images or articles, giving you a quick-reference gateway to your research. I hope all you long-form writers out there find these methods helpful – especially my fellow visual and kinesthetic learners. Remember, I always welcome questions. If you have an outlining method that you want to share, please do so in the comments! Great blog, Mindy. Thanks for sharing it (I’m part of the Women Writers group on FB). Would love it if you follow my blog and like my author page, as well. Thanks, Dawn! Happy that you stopped, and thrilled that the Women Writers group connected us. I’m following your pages now, too, and look forward to the learning and dialogue to come!